Haven’t decided on a hotel yet? You can look at other available hotels in the Tayside region with Booking.com. A region encompassing the old counties of Perth and Angus, Tayside is a lovely area of quiet glens where the Highlands meets the Lowlands. It abounds in castles and palaces—the historical Glamis Castle and Scone Palace for starters. 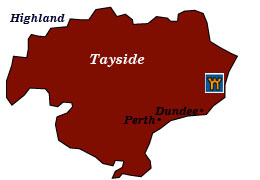 Tayside takes its name from the Tay River, with trout and salmon fishing popular activities. Coastal cities are influenced inevitably by the sea. The region tends to be overlooked by tourists, all the more reason to visit and discover an authentic Scotland. Perth The former capital of medieval Scotland, modernization has pretty much swept away any inklings of its illustrious past. Within Perth’s environs, though, Balhousie Castle is home to the Regimental Museum of the Black Watch. Scone Palace, the current home of the earl of Mansfield, exhibits a fascinating insight into the lifestyle of Scottish nobility. On the grounds is Moot Hill, the ancient coronation site of the kings of Scotland. The Stone of Scone, seized in 1296 by Edward I, lay in Westminster Abbey until returned to Edinburgh Castle in 1996. Glamis Castle The childhood home of Queen Elizabeth II’s mother and the birthplace of Princess Margaret, this former 11th-century royal hunting lodge resembles a fine château you’d see in the Loire Valley. Rooms you may visit include the Queen Mother’s former bedroom and Duncan’s Hall, the setting for the king’s murder in Shakespeare’s Macbeth. Blair Castle With origins dating back 700 years, this splendid turreted white castle has been modified over the years to reflect the ever-changing tastes of the aristocracy. Its owners, the dukes of Atholl, had the distinction of being allowed to maintain a private army, an honor bestowed by Queen Victoria. Dundee A major 18th- and 19th-century ship-building center, you may climb aboard the RSS Discovery, the ship used by Captain Robert Scott on his polar expeditions, and the Unicorn, a 46-gun wood frigate that is Britain’s oldest floating warship (and the 4th oldest in the world). An ambitious urban renewal program is slowly restoring the city to its former glory. Kirriemuir Fans of J.M. Barrie, the author of Peter Pan, will want to visit the town of his birth (and his final resting place). A simple white cottage is filled with memorabilia of the town’s most famous son.